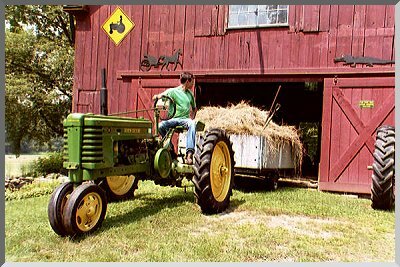 Don't hold your breath waiting to see a hay baler operating on THIS little farm! 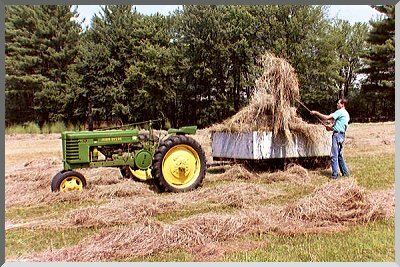 If I had a vintage baler in working condition, I'd love to use it; but until then, it's going to have to be done the old fashioned way. Loose hay is much more fun for hayrides anyway! Actually, the only reason I do any haying at all is to keep the fields mowed. 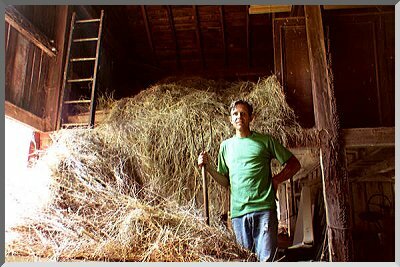 I save enough of the first cutting to fill one bay in the hayloft. That will be enough to last all winter as bedding for the ducks and geese. The rest, I use as mulch to keep the weeds down in the garden. This adds nice organic material to the soil when it is turned in, in the fall. The rest of the summer I just mow the fields often enough so that I don't have to rake it up again.